It’s worth heading to the visitor’s centre located within the old stables first to get a feel for the castle’s history and developments over the years. After that, you’ll probably want to head either to the ruins, or the only bit of the castle which isn’t in ruins – the attractive gatehouse. Known as Leicester’s Gatehouse, it dates back to the 1570s and has several floors which have been furnished inside in keeping with its use over the years. On the top floor is an exhibition detailing the relationship between Dudley and the Queen. When you explore the ruins, you’ll find that some still have battlements you can walk on. When you climb to the top, you get a great view of the surrounding area including the parkland which was once flooded to make a large lake. There are quite a few surviving staircases and walkways too that you can explore. It’s hard to picture in your mind exactly how the castle would have looked before it was destroyed, but much of it is explained on the various information signs in locations around the ruins. 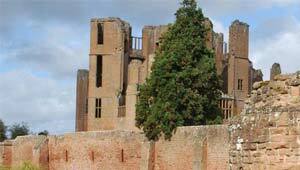 We really enjoyed our trip to Kenilworth Castle and we spent a good two hours wandering around before enjoying the coffee shop in the converted stables.